Nitrogen and sulphur based heterocyclic molecules have gained significant attention owing to their broad spectrum pharmacological profiles. Thiazine is one of such promising scaffolds which has been widely utilized in the synthesis of compounds that possess interesting biological profile including anti-proliferative, anti-bacterial, antipsychotic, analgesic, anti-inflammatory, antifungal and antiviral activities. The current review focuses on the chemistry of thiazine and its derivatives along with potential pharmacological activities reported for these in scientific literature. Multifaceted pharmacological profile of thiazine derivatives provides new aspects for the design of superior medicinally active agents. Keywords: Thiazine, antimicrobial, antifungal, antimalarial, anticancer, thiazine scaffold. Keywords:Thiazine, antimicrobial, antifungal, antimalarial, anticancer, thiazine scaffold. Abstract:Nitrogen and sulphur based heterocyclic molecules have gained significant attention owing to their broad spectrum pharmacological profiles. Thiazine is one of such promising scaffolds which has been widely utilized in the synthesis of compounds that possess interesting biological profile including anti-proliferative, anti-bacterial, antipsychotic, analgesic, anti-inflammatory, antifungal and antiviral activities. 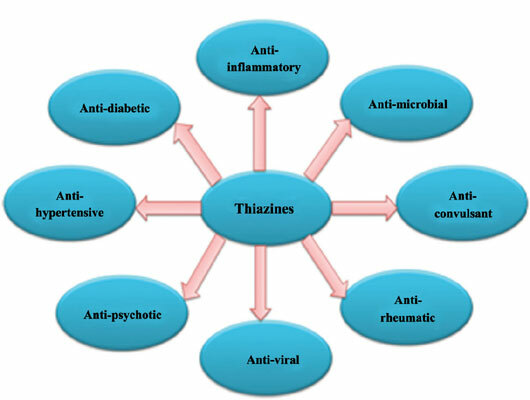 The current review focuses on the chemistry of thiazine and its derivatives along with potential pharmacological activities reported for these in scientific literature. Multifaceted pharmacological profile of thiazine derivatives provides new aspects for the design of superior medicinally active agents.